If you’re having general issues with ShowOne such as the app not importing tracks, having your imports limited even though you’ve purchased the “Basic version”, or some overall playback problems, try these quick steps before contacting support. Check to see if the problem persists after each step. NOTE: Our support form here on the site isn’t working. If you do need to contact us, email support@onezerooneaudio.com. Update ShowOne to the most recent version. Note what iOS device and iOS version # you’re on. We recommend using the latest iOS version – if possible, update to it. Quit ShowOne, and give the iOS device a hard reset. Google how to do this for your particular device – usually you hold down Home and Sleep buttons for 10+ seconds, but iPhone 7/8 are different. Make sure you’re signed into your Apple ID. Open ShowOne and see if you have the same problem. If you’re having trouble importing audio files, make sure any cloud apps you use with ShowOne (Dropbox, Google Drive etc) are updated to their latest version. Open the cloud app you use with ShowOne and check there are no “what’s new” or other alerts that have come up after an update – this can prevent ShowOne and other apps from interacting with it properly (particularly Dropbox). If you’re having problem with audio playing properly, check if it’s a particular track or tracks causing it. Try importing different tracks and see if it still happens. Make sure any headphones, audio cables, or interfaces are connected properly and securely. 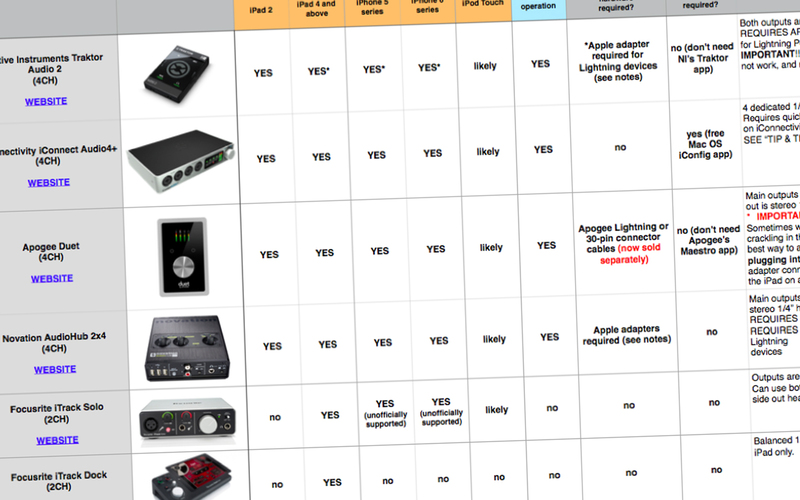 If you’re using an audio interface, insure it’s firmware and settings are updated as needed. Check through the below FAQs, the tutorial videos, and Tips & Tricks to see if we have a solution to your problem there. If you’re still having the issue after all of these steps, delete the app completely* from the iOS device, then reinstall from the App Store. Your purchases will return as long as you’re signed in to the same Apple ID as when you bought them. *NOTE: If you already have a lot of tracks imported with settings etc, you may want to only do this as a last resort, as this will return the app to it’s default state and you’ll have to re-import all of your music manually. If troubles persist, let us know your iOS device and version # and any other pertinent details and we’ll look further into the issue. NOTE: We’ve heard reports that having the “Moment” app installed and running can cause playback problems with numerous audio apps including ShowOne. If you have this app on your device, we recommend removing it. What do I need to use ShowOne? An inexpensive stereo breakout or “DJ splitter” cable (NOT a regular headphone splitter!) to split your iOS device’s stereo headphone jack into two mono channels. 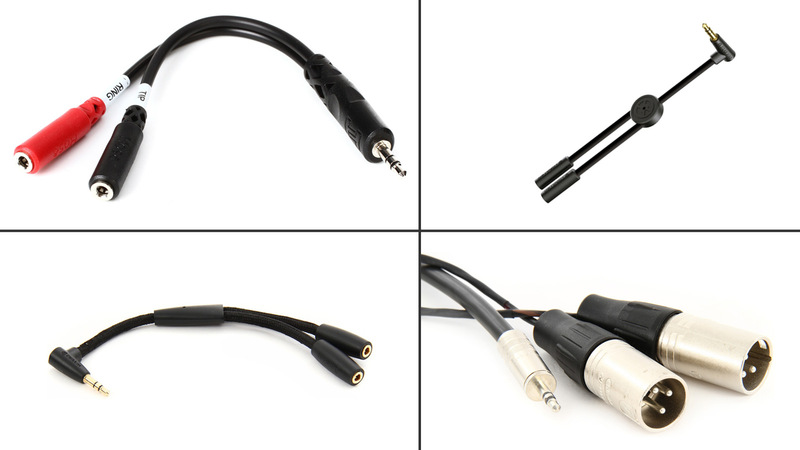 See our Tip & Trick about cables for an in-depth look at the different options. With only this equipment, you can play a live show or rehearse properly with backing tracks. The automatic click track will play out one channel of the stereo cable along with the music for the musician wearing the earphones to play along to, while just the music will play out the other for the audience to hear. See the FAQ “How is audio routed in ShowOne?” for more details. You’ll get more flexibility with a 3rd party audio interface, and for practicing, learning music, or certain performance situations you may not even need the stereo cable, so make sure you know what you want to use ShowOne for before investing in any additional gear. Do I need to know the tempo of the songs I import? In order to use ShowOne the way it’s intended, yes. Entering the correct tempo and time signature of an audio file at the Import stage is VITAL to ShowOne working correctly with your audio. Otherwise the click track will be out of sync with your music. If you enter the wrong tempo when importing and realize that the click isn’t in sync with the song, you can change “Original Tempo” in Track Settings until you have the correct one. NOTE: If you don’t need ShowOne’s automatic click, and simply want to use the app for it’s sets and other editing features, the initial tempo doesn’t matter and you can leave the default of 100 (the bar counter will not be accurate in this case). Make sure you turn the click all the way down in Settings. TIP: Name your audio files for use with ShowOne with the tempo in BPM (beats per minute) at the end of the file, e.g. “mysong_124.wav”. That way you can always see what the correct tempo is when importing your audio into the app. The click sounds out of sync with my song, how do I fix that? SCENARIO 1: The click is completely out of time with the audio or gradually loses sync as the song plays. You have the wrong tempo information entered for the audio file, or the audio has a tempo change in it. Check your DAW or other source for your tracks, note the correct tempo, and enter that in the track’s “Original Tempo” field in Track Settings -> Track Import Settings. Tempos must be fixed at one BPM value (up to two decimal places), and make sure there are no tempo changes in the audio. If it’s a commercial track you can try looking up the tempo in an online database – here’s one and here’s another. Otherwise use a free tap tempo app (such as Nome) to figure out the track’s tempo by tapping along to the music. NOTE: Look for fractional tempo and tempo change capability in future updates of ShowOne. SCENARIO 2: The click seems to be at the right tempo but is playing ahead of the beat. This is often caused by a small amount of space or “leader” before the song begins as is found in most commercial recordings. When printing tracks from your DAW we always recommend bouncing right at a bar line to minimize this issue. However even then there may be a small amount of space at the top of the song due to several factors including high latency plugins or processing delay. In this case, the Click Delay setting should solve the problem. Push the edit button (“i” symbol) next to the track name in either Set View or the Tracks list. Press the Click Delay button (found in Click Options) and adjust the slider to a given milliseconds value (0ms-500ms); this will push the click back the chosen amount. Try different settings while listening to the click against the audio until it sounds like they are in perfect sync – even 10ms can make a difference and feel more locked with the audio. Press the back symbol in the upper left corner to save your changes. TIP: This is a great way to get the click in sync with commercial songs to either practice or perform to, since most will have that space at the beginning. NOTE: Occasionally when editing tempo and pitch settings of a track the click may appear to be slightly off time; simply save your settings by going back into the Set or Tracks list, and the click will be locked in with your audio again. I'm hearing the click loudly through the speakers - why? You are using a normal “headphone splitter” instead of a stereo breakout cable (AKA Y-cable). The common splitters you’ll find at the Apple Store, Best Buy, airport kiosks etc simply duplicate both sides of the headphone jack so that two people can listen to the same source. Do NOT use one of these with ShowOne. If you do, both ends of the cable will output the entire stereo signal, so the click will be coming out both sides. You need to get a cable that splits the stereo signal into it’s component L/R mono signals. See our Tip & Trick about cables for an in-depth look at the different options. You have your iPhone or iPad set to “Mono” mode. Go to the device’s Settings -> General -> Accessibility, and scroll down to the “Hearing” section. Make sure the Mono switch is turned OFF, and that the pan between L and R is right in the middle. If you know #1 and #2 above are correct but hear the click out of the PA clearly, you may have the sides flipped. Try changing “Cue Pan” in Settings from one side to the other and see if that fixes the issue. If you know you have things connected properly and are hearing the click or voice count faintly through the PA, you may have a small amount of bleed or crosstalk. The ShowOne Crosstalk Control can help – see the FAQ and video tutorial for details. NOTE: If you are using an audio interface (in either 2 or 4 channel mode) and are having a similar issue, double check your settings and audio routing to make sure things are connected properly. Check additional FAQs and the “Tips & Tricks” section for more details on using 3rd-party audio interfaces with ShowOne. How do I change the tempo, pitch, or other settings of a track? Push the edit button (“i” symbol) next to the track name in either Set View or the Tracks list. 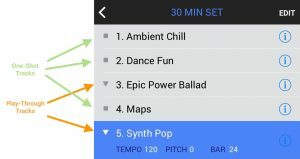 To change a track’s tempo: press the Tempo button and enter a new tempo into the field in BPM (up to two decimal places). The track will now play back at this tempo with the internal click track staying in time with the music. To change the pitch or key of a track: press the Pitch button and choose a pitch adjustment via the slider. “+1” will make the audio play back at one half step or semitone up, “-3” at three semitones down, and so forth. Press the back symbol in the upper left corner to save your changes. The track will now play with it’s new settings in all sets. There are many other settings in here – check the other FAQs and videos for more details. Can I play one track straight into another within a set? Tracks in a set can play in one of two modes: One-Shot and Play-Through. One-Shot is the default setting; in this mode a track’s playback will stop upon reaching the end of the track. In Play-Through mode, the track will advance directly into the next track when complete and start playing it immediately. To adjust this behavior of tracks in a set, press the Edit button in the upper right corner of Set View in your chosen set. Press the “stop” symbol next to a track name; the button will expand to show the selector buttons. Press the “play” symbol (downward facing triangle) – this track is now in Play-Through mode and will play into the next track. Each track’s play-through mode will be denoted by the corresponding symbols in both Set and Show Views. NOTE: These settings are set dependent, so you can have the same track in several sets each with it’s own play through behavior. How is audio routed in ShowOne? Audio in ShowOne is split into two outputs – the Main output and the Cue output. The Main output always plays just the audio from your tracks. The Cue output always plays ShowOne’s internal click and countoffs, and also an adjustable amount of the track audio as well. In ordinary 2-Channel mode, the Main output is sent to the right side of your device’s headphone jack, and the Cue output to the left (you can flip these with “Cue Pan” in Settings). 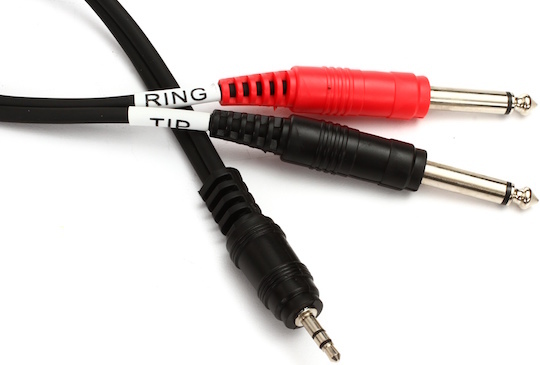 Use a stereo breakout cable or “DJ splitter” (like THIS or THIS, NOT a regular “headphone splitter” like THIS) connected to the headphone jack to split the stereo signal into two mono signals. Send the Cue output to the musician by way of earphones or in-ear monitors, and the Main output to the audience through the mixing board and PA speakers. You can also connect both outputs to a mixer for greater control. 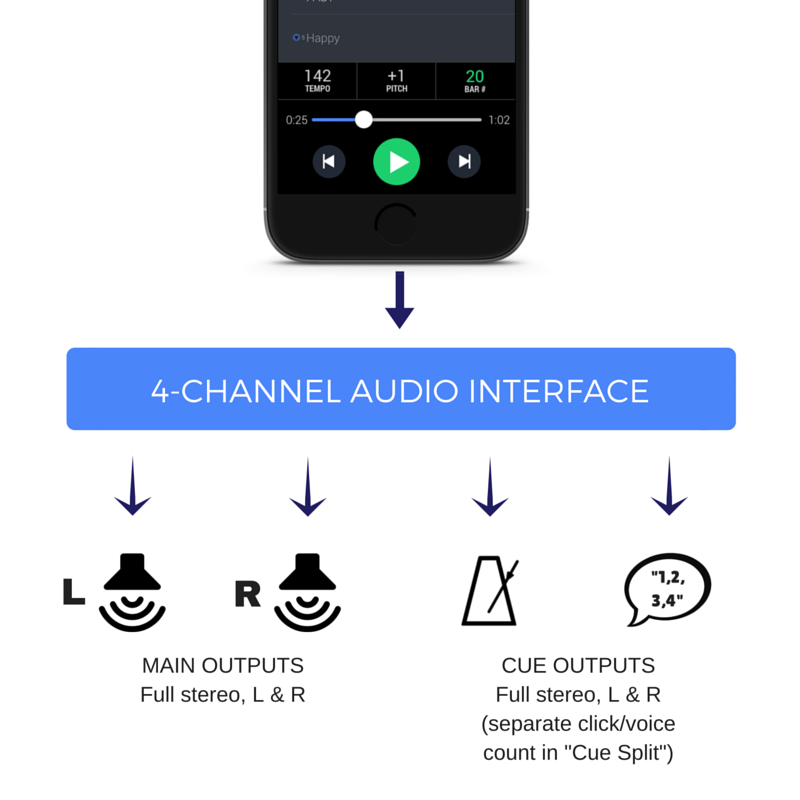 In 4-Channel mode (available as in-app purchase in the Shop), the Main output becomes stereo and is sent to outputs 1/2, and the Cue output, also stereo, is sent to outputs 3/4. See additional FAQ below for details. NOTE: In 2-channel mode ShowOne sums both the Left and Right sides of your audio files into mono and sends that to the Main output so that none of your audio information is lost. To play audio files as normal stereo through the output give the track a User Cue setting (see other FAQ). NOTE: The audio sent to the Main output is always at a fixed level. Cue Track Volume only adjusts the music level to the Cue output. TIP: Use a 3rd party iOS audio interface for greater control of outputs and higher fidelity audio. TIP: Though not required, try using a DI box on each channel coming out of the iOS device for impedance matching and easier connection to mixers and stage boxes. I have backing tracks with my own click or cues printed to one side - can I use those? Yes! Simply choose User Cue “L” or “R” during import (or from within Track Settings) for whichever side has your clicks or cues printed on it. ShowOne will output that side only through it’s internal Cue channel, and the other side through the Main channel. Simply have the musician monitor the Cue side as normal, and send the Main side out to the audience or PA. NOTE: User Cue works in both 2 and 4-channel mode. TIP: You can still add ShowOne voice countoffs to User Cue tracks – try it! TIP: Want an easy way to play your tracks in stereo in 2-channel mode, like any old audio player? Simply set it as a User Cue track. In it’s default mode (with User Cue set to “None”) and in normal 2-channel mode, ShowOne sums the audio files’ channels to mono and transmits that to both Cue and Main channels. That way the audience can hear all the information in the track (not just one side) and the musician can hear it as well as determined by Cue Track Volume. User Cue simply tells ShowOne to play this file as a normal stereo file out the output. NOTE: The ShowOne Click Mute setting will automatically be set to “bar 1” for any User Cue track, since it’s assumed that you won’t want both ShowOne’s click and your own, printed click playing concurrently. You can always change that by manually changing the Click Mute setting. Can I have tracks that are just the click track/metronome? If you like having a metronome to keep things at a stable tempo during your performances but don’t play to backing tracks all the time, simply import blank audio files and set their tempos at whatever you want them to be to reflect each song’s tempo in your set. NOTE: Look for special Metronome Tracks in a future update. I have an audio interface/MIDI footswitch/etc, will it work with ShowOne? ShowOne works great with 3rd party interfaces and controllers. It will pass audio to any iOS audio interface that supports Core Audio (this is just about all of them), including USB interfaces meant primarily for Mac or PC. The Apogee Duet/Quartet, Focusrite Scarlett Series, and Novation AudioHub 2X4 are just a few that integrate with ShowOne. 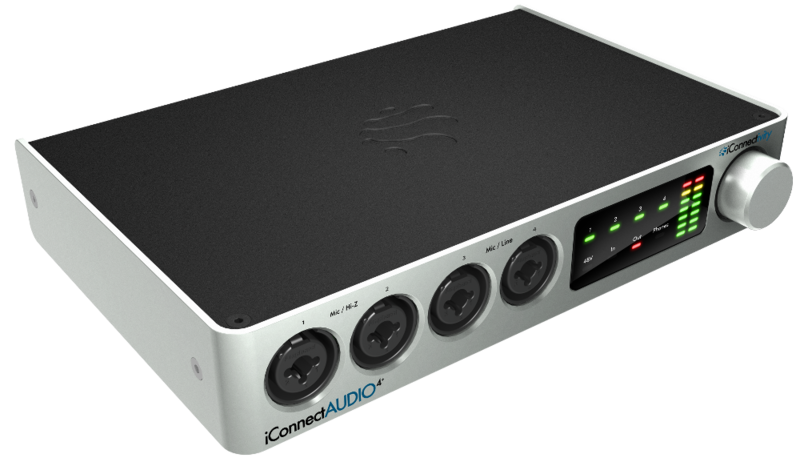 Having an interface provides higher quality converters, more versatility with outputs, and tactile control. And connect an external MIDI controller such as a footswitch, drum pad, or keyboard to control ShowOne’s transport externally*. Works with Bluetooth MIDI controllers as well! TIP: If you have an interface with more than 2 dedicated outputs, you can use ShowOne in 4 channel mode (available as in-app purchase in the Shop)! See the other FAQs and the Tips & Tricks section for details. NOTE: Use the Apple USB to Lightning Camera Adapter (or Camera Connection Kit for older 30-pin iOS devices) to connect to USB interfaces not specifically designed for iOS. Check the compatibility chart in the Tips & Tricks section for details. 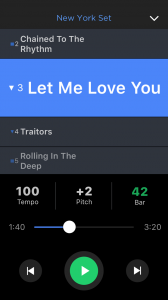 ShowOne is an iOS app for playing and working with backing tracks in a live music environment. 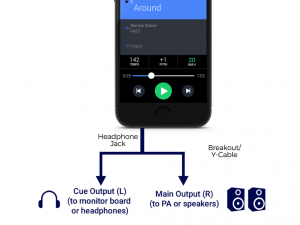 The app provides an automatic click track in sync with any imported audio – all you need to know is the tempo of the track. 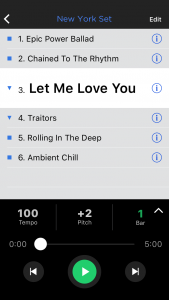 Arrange your songs into sets and adjust key parameters of each track such as tempo, pitch, and voice counts right from within the app so you can keep up with the fluid nature of live performance. Everything is routed so that you the musician hear what you need to, and the audience hears only the music. Operation is rock-solid and skip-free. Importing your audio tracks is easy and fast. ShowOne is designed from the ground up by pro musicians; you can count on it in your next rehearsal, show, or tour. Look through the extensive FAQs for more info and check it out it for yourself. It’s free to try – download it HERE. NOTE: ShowOne currently does not come with preloaded libraries of backing tracks to jam or practice to – the app is designed to work with tracks that you create or bring in from other sources. You may be a pro familiar with the difficulties that go along with playing along live to pre-recorded music. Or you may be just starting out in the world of backing tracks and not know where to begin. In either case ShowOne has you covered. NOTE: ShowOne makes a great “fly rig”: if you normally use a large and complex playback system and need something quick and mobile that can pack in a carry-on but won’t skimp on essential features, give ShowOne a try. 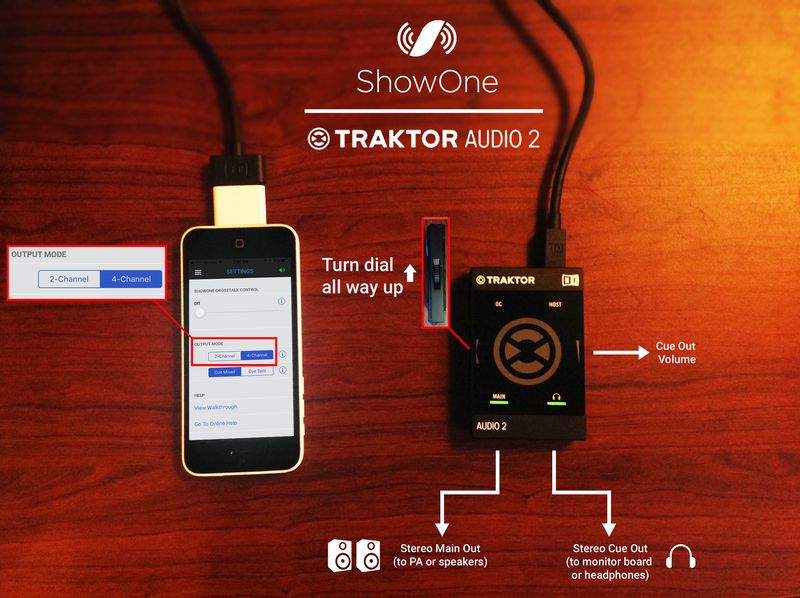 Are there other uses for ShowOne besides backing tracks? ShowOne makes an excellent backup device for musicians and groups that require more advanced setups. Even if your normal situation calls for more complex playback systems, you can import your tracks into ShowOne to have on hand as a fool-proof, mobile backup for when things go down. The app also makes a terrific practice tool. ShowOne’s automatic click makes it easy to play along with all sorts of music, particularly for drummers. Load tricky parts that you’re trying to learn into the ShowOne app and slow down the tempo to get every note or rhythm perfectly. If you’re a singer or theater performer you can use ShowOne to change the pitch or slow down difficult passages in the songs you need to learn for your performance. And music educators of all types can find ShowOne’s pitch and tempo manipulation useful in their lessons. With only this equipment, you can play a live show or rehearse properly with backing tracks. The automatic click track will play out one channel of the stereo cable along with the music for the musician wearing the earphones to play along to, while just the music will play out the other for the audience to hear. See the FAQ “How is audio routed in ShowOne?” above for more details. You’ll get more flexibility with a 3rd party audio interface, and for practicing, learning music, or certain performance situations you may not even need the stereo cable, so make sure you know what you want to use ShowOne for before investing in any additional gear. Grab the necessary cables, audio interface, and more from the ShowOne Accessories Store. 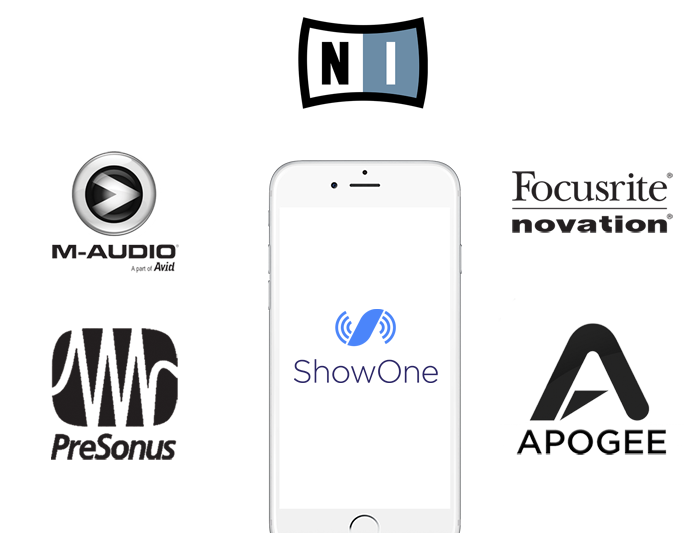 What iOS devices support ShowOne? ShowOne will work on all iPhones 4S and higher, all iPads except the original iPad 1, and the 5th generation or higher iPod Touch. iOS 9.3 or greater is required. Apple Watch is not supported. IMPORTANT: The iPhone 4 and iOS 7/8 is only supported by ShowOne version 1.2.3 and lower. Upgrade your device or iOS to take advantage of the latest features and updates. Why can't I find ShowOne on my iPad? 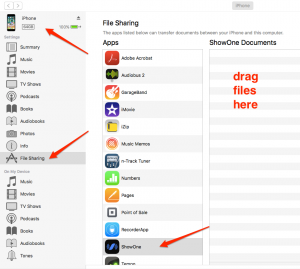 ShowOne is indeed available and works great on iPads – you just need to know where to look. With iOS 11/12 it’s under the “Filters” menu in the upper left corner after doing the search – switch the “Supports” to “iPhone Only”. ShowOne will then show up in the search. For iOS 10.3.3 and earlier simply switch from “iPad Only” to “iPhone Only” in the upper left corner. How do I import my music into ShowOne? 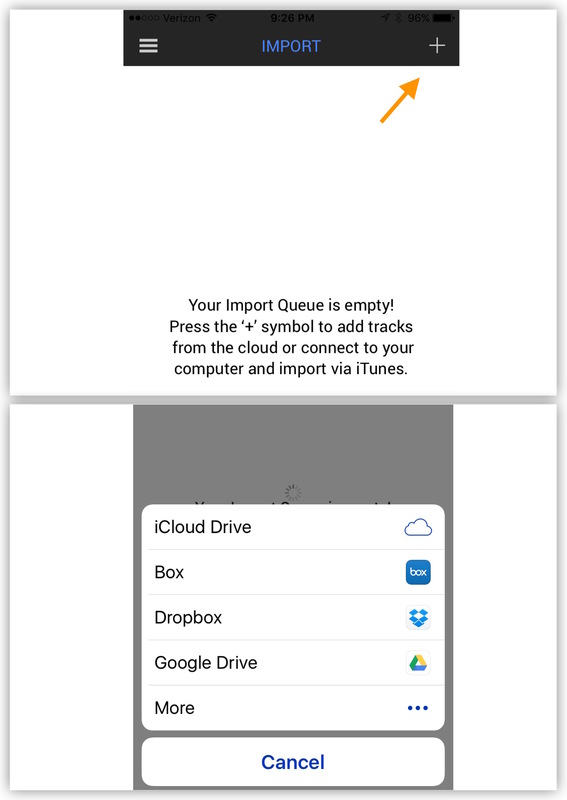 Import audio files via cloud-based services (such as Dropbox or iCloud) directly from the device. Import audio files via iTunes File Sharing with your device connected to a computer. NOTE: Importing music directly from your iTunes/Apple Music or Spotify libraries on your iOS device is not allowed. IMPORTANT: The free version of ShowOne allows you to have up to two of your own tracks at a time in the app; pick up the Basic version (available in the in-app Shop) for unlimited track imports. How do I import files into ShowOne from the cloud? 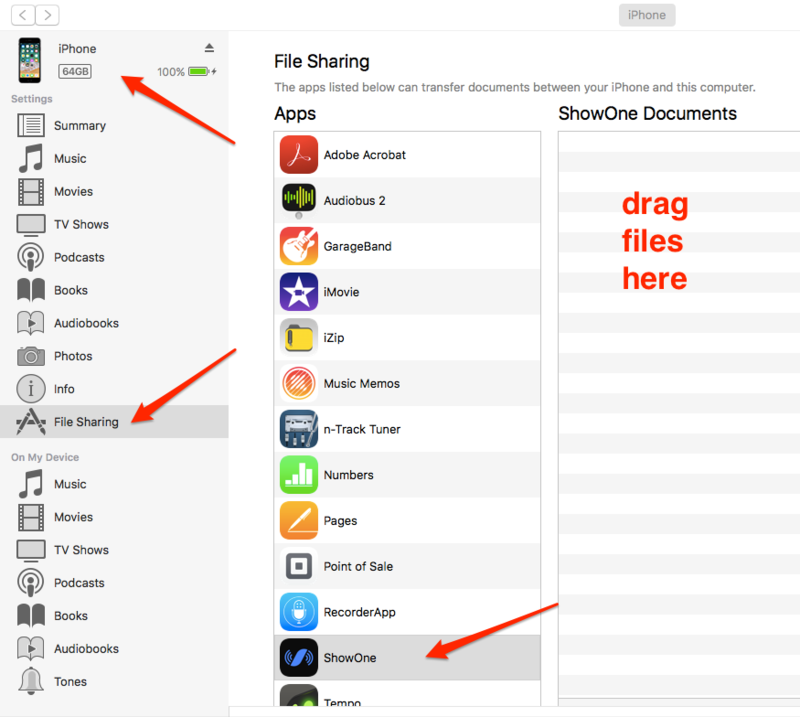 ShowOne supports importing audio files from iCloud, Dropbox, Box, and Google Drive, and some other file apps. 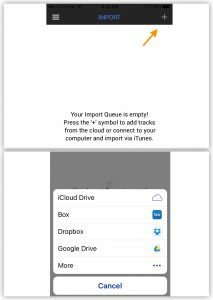 As of iOS 11 imports happen via integration with the Files app. NOTE: In order to use one of these services, you will need an account with the chosen service, and have that service’s iOS app installed on the device with which you wish to use ShowOne. Make sure you have the latest versions of ShowOne and any cloud apps to ensure compatibility. Once your audio files are in your cloud service’s folders and ready to bring in to ShowOne, press the big “Import” button on the Tracks Screen. Push the “+” symbol in the upper right corner. iOS 11: this will open the Files app picker. Navigate to the desired cloud service. iOS 10.3.3 and earllier: this will open a small Locations window in which you can choose your desired cloud service. Go to the folder where you keep audio files to be used with ShowOne and select the file you wish to import; the file will download to your device. NOTE: Large files such as WAV may take a long time to download and complete the import process, be patient. When complete, you’ll see an “Import Successful” alert screen and a note to input the audio file’s original tempo and time signature. Leave User Cue at “None” unless you’re importing a track that already has a click printed to one side. Press OK – you can then import further files via the “+” button again or complete the import process for this file by pressing the blue “Import” button. Can I import many files at once into ShowOne with iTunes? ShowOne supports iTunes File Sharing; you can simply drag and drop files or groups of files directly into ShowOne via your computer’s iTunes when your device is connected via USB cable. TIP: This is the ideal way to import large numbers of files simultaneously. For one file at a time the cloud works great. The files will immediately appear in ShowOne’s import queue. Go to the “How do I complete the import process?” FAQ for the next step. How do I complete the import process for a track? Entering the correct tempo and time signature of an audio file at the import stage is VITAL* to ShowOne working correctly with your audio. Otherwise the click track will be out of sync with your music. When you have one or more files listed on the Import screen, press Import to finish the import process. For each file that is checked, enter the track’s name as you’d like it to appear in ShowOne and the tempo and time signature of the music in each audio file. Press Save for each file you want to import. Each file you save is now a ShowOne track! TIP: If you find you’ve entered the wrong tempo or time signature during import, you can change them in a track’s Settings->Original Tempo / Time Signature. * If you don’t need ShowOne’s automatic click, and simply want to use the app for it’s sets and other editing features, the initial tempo doesn’t matter and you can leave the default of 100 (the bar counter will not be accurate in this case). Make sure you turn the click all the way down or put the app into 4-channel mode (see below FAQs). Can I import tracks directly from my iTunes/Apple Music/Spotify libraries on my device? Currently no. But you can drag audio files directly from iTunes on your computer to a cloud folder or into iTunes File Sharing to get them into ShowOne. See the other importing FAQs for details. What audio formats does ShowOne support? ShowOne works with most major audio file formats, including MP3, AAC, WAV, and AIFF; 24 or 16 bit, sample rates up to 96k. Can I have tempo changes in my tracks? Currently no. Audio with tempo changes will cause the automatic click to lose sync. We are looking into workarounds for this to be addressed in future updates. But you can of course change the tempo of audio once it’s in ShowOne! Can I have tracks with tempos that aren't whole numbers (such as 130.5)? Yes! ShowOne supports tracks with tempos up to two decimal places (like 120.55 for instance). Whenever you play a track, ShowOne provides an automatic click in time with the audio. Play along to it in order to keep sync with your backing tracks. 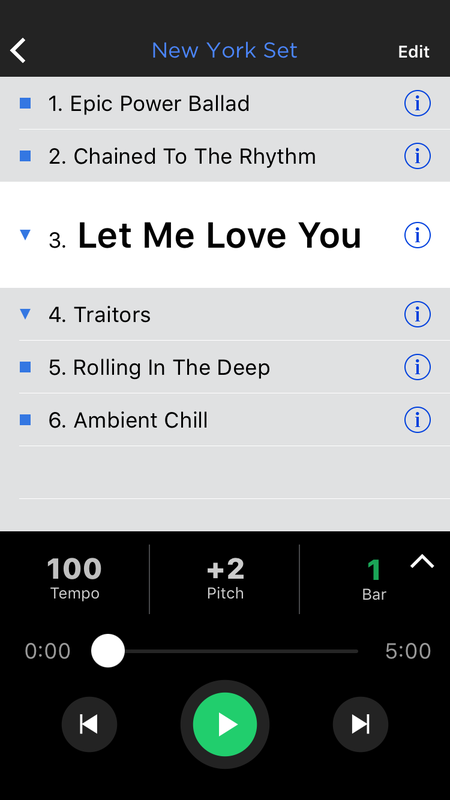 You can edit aspects of each track such as tempo and pitch in Track Settings. Tracks and their settings stay saved with ShowOne until you delete the track or remove the app from your device. To see all the tracks you have in ShowOne at any given moment go to the Tracks screen from the Home page. How do I create or delete a set of tracks? Go to the Sets screen from the Home page. Press the “+” symbol to enter the New Set screen. 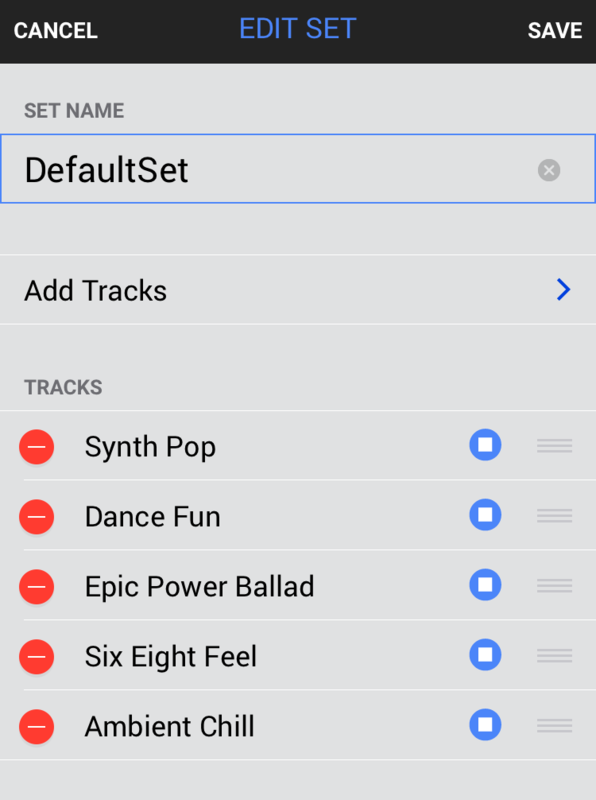 Give your set a name and press the Add Tracks button to enter the Tracks screen; here you can choose tracks you want in the set by pressing the check mark next to each track name. You can preview tracks by pressing the Play button. When finished press Save; your new set will appear in the Sets screen. Make as may sets as you wish. You can delete sets by swiping left on the set name. Enter your chosen set from the Sets screen by pressing it’s name. You’re now in Set View and can see all the tracks you’ve added to that set. Play and pause tracks with the transport at the bottom, and use the scrub slider to navigate within each track. 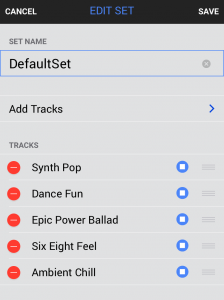 Skip to different tracks by using the transport buttons or pressing on a track name. You can change overall Set settings with the Edit button at upper right, and individual track settings with the “i” edit button next to each track name. Press the small up arrow in the Transport to enter Show View. NOTE: During playback, pressing a song title that’s different than the currently playing one won’t skip to that track; this is to prevent accidental track skips. Show View is the main screen for playing your sets. We think of it as the ideal screen to play a show from – text is big and clear, and all the important info such as tempo and bar position is easily visible even on small devices. Of course you can work purely from Set View if you wish; choose whichever you prefer. Press the small up arrow in the Transport in Set View to enter Show View, and press the down arrow at the top of the screen to return to Set View. How do I add/re-order/remove tracks in a set? From Set View, press the Edit button in the upper right corner. Press and hold the drag symbols to the right of the song titles to move songs into the desired order. Press the red “-” symbols next to track titles to remove them from the set. You can also add tracks and rename the set here. Press Save to save your edited set. TIP: Choose which tracks will play through into the next automatically here as well (see additional FAQ). To change a track’s tempo: press the Tempo button and enter a new tempo into field. The track will now play back at this tempo with the internal click track staying in time with the music. How do I add a voice count-off to the beginning of a track? Push the edit button (“i” symbol) next to the track name in either Set View or the Tracks list. Press the Voice Count button and choose a voice count of 1, 2, or 4 bars (or none). Press the back symbol in the upper left corner to save your changes. You will now hear a voice count of the selected length play whenever you play the track from the beginning. The count off plays out the same channel as the click. TIP: If you have a 4-output audio interface connected, use “Cue Split” mode (found in global Settings) to have the countoff play through it’s own output, independent of the click’s output. My track is too long / has blank space at the end / I want to change where the song starts - can I do anything about that? Push the “i” symbol next to the track name in either Set View or the Tracks list. Go to Track Options and press the Trim button; adjust the Start and End Trim settings to the desired amounts with the sliders. When finished, press the back symbol in the upper left corner to save your changes. The track will now play with the desired trim settings in all sets. TIP: For instance, if you want to remove the 8 bar intro from your song and have it start right at say a verse, choose “8 bars” with the Start Trim slider. Or, if you have four bars of empty space at the end of the song and want to get rid of it, select “4 bars” with the End Trim slider. How do I delete a track from ShowOne? Push the edit button (“i” symbol) next to the track name in either Set View or the Tracks list. Press the trash icon in the Transport area – the track will be removed from all sets and deleted from the app entirely. I want to have two versions of the same song with different pitch or tempo settings - how do I do that? Simply import the audio file a second time and name it something different. If it’s the same audio file make sure you enter the correct original tempo and time signature when importing. Then adjust that track’s settings as needed. In ordinary 2-Channel mode, the Main output is sent to the right side of your device’s headphone jack, and the Cue output to the left (you can flip these with “Cue Pan” in Settings). Use a stereo breakout cable or “DJ splitter” (like THIS or THIS) connected to the headphone jack to split the stereo signal into two mono signals. Send the Cue output to the musician by way of earphones or in-ear monitors, and the Main output to the audience through the mixing board and PA speakers. You can also connect both outputs to a mixer for greater control. In 4-Channel mode, the Main output becomes stereo and is sent to outputs 1/2, and the Cue output, also stereo, is sent to outputs 3/4. See additional FAQ below for details. Adjust the levels of the click and how much music is fed into the Cue output (“Cue Track Volume”) from the Settings screen on the Home page. How does 4-Channel mode work in ShowOne? With 4-Channel Mode, available as an in-app purchase from the Shop, you can send the full stereo mix of your audio to the audience while also having a more flexible stereo Cue output for the musicians. You’ll need a 3rd party iOS audio interface that supports 4 outputs connected to your device to fully utilize this feature; the NI Traktor Audio 2, Novation Audiohub 2X4, and iConnectivity iConnectAUDIO4+ are a few of our favorites. With a compatible interface connected, go to Settings from the Home page and change the Output Mode from 2-Channel to 4-Channel. This will send the Main output of ShowOne to channels 1-2 of the interface (usually the “Main” or primary output), and the Cue output to channels 3-4 (usually the “Headphone” or secondary output), both in full stereo. Cue Pan is disabled, and the click and count offs play out both channels of the Cue output, known as “Cue Mixed” Mode. “Cue Split” mode will play the count-off out of channel 3, and the click out of channel 4. TIP: Cue Split works well when connected to a monitor mix feeding in-ear monitors. For instance, with this mode you can send the count-off channel to all the musicians so everyone knows where to come in, while sending the click only to who needs it most (read: the drummer). TIP: There are several great 4-output audio interfaces that work with ShowOne; see the Tips and Tricks section for details and a compatibility chart. Some may require additional setup before using with ShowOne. TIP: Need to play your audio tracks in “normal” stereo, they way they would via iTunes or any audio player, and don’t need to use ShowOne’s clicks and voice counts? Simply go into 4-channel mode without any connection to outputs 3/4. The main outputs play your audio files L/R with no down-mixing to mono or click (since the Cue channels are over on outputs 3/4 which you’re not using). What cables should I use with ShowOne? There are many choices for stereo breakout or Y-cables on the market that will split your headphone jack into it’s Left and Right signals for use with ShowOne. They are mostly inexpensive and can be found at any audio or musical instrument store, both brick and mortar or online. See our Tip & Trick for an in-depth look at the options and links to purchase. I want to use a different click sound, is that possible? Go to Settings->Click Settings->Click Sounds, and choose a different click from the menu. Four click sounds are available in the Basic version of ShowOne. In the free version only the Default click sound is available. TIP: More clicks including familiar sounds from popular DAWs are available in Click Packs in the in-app Shop. How do I change the volume of the click and music in my earphones? Go to Settings -> Volume and Pan and adjust the Click and Cue Track Volumes sliders to control the level of each to the Cue channel. Use the “Preview” button to hear the last played track with a click/voice count loop for reference. NOTE: Remember, Cue Track Volume adjusts the amount of the music sent to the Cue channel (the side with the click and voice counts). The Main channel (the other side without click and counts) is always at a fixed nominal level. You have the wrong tempo information entered for the audio file, or the audio has a tempo change in it. Check your DAW or other source for your tracks, note the correct tempo, and enter that in the track’s “Original Tempo” field in Track Settings -> Track Import Settings. Make sure there are no tempo changes in the audio. If it’s a commercial track you can try looking up the tempo in an online database – here’s one and here’s another. 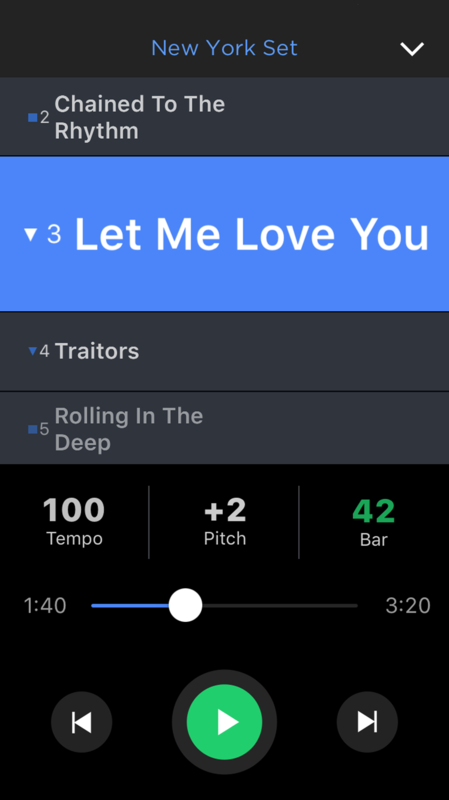 Otherwise use a free tap tempo app (such as Nome) to figure out the track’s tempo by tapping along to the music. Push the edit button (“i” symbol) next to the track name in either Set View or the Tracks list. Press the Click Delay button in Click Options and adjust the slider to a given milliseconds value (0ms-500ms); this will push the click back the chosen amount. Try different settings while listening to the click against the audio until it sounds like they are in perfect sync – even 10ms can make a difference and feel more locked with the audio. Press the back symbol in the upper left corner to save your changes. Can I mute the click within a track? Sometimes it may be desirable to have the click turn off at some point during a track, such as the end downbeat of the song as the instruments are fading out, or even for the duration of the entire track. Do so with Click Mute, found in the track settings screen. Select a bar number with the slider, and the click will automatically mute when playback reaches that bar during the track. Tip: To mute the click for the entire track, simply choose “Bar 1”. If you are using the correct type of Y-cable, but hear the click out of the PA clearly, you may have the sides flipped. Try changing “Cue Pan” in Settings from one side to the other and see if that fixes the issue. I hear the click and count-off faintly bleeding out of the speakers, can I fix that? If you’re properly set up but are hearing some of the Cue signal bleeding into the Main output, then the exclusive ShowOne Crosstalk Control, or SCC, found in Settings, can help. Press the Preview button in Settings. This will play a loop of the click and count-off along with the previously played track. Slowly raise the SCC slider. At some point on the slider, you should hear the bleed signal in the Main output start to thin out and get fainter. Adjust it precisely to the point at which the crosstalk sounds the faintest and weakest. In most cases it will weaken the signal to a level that will be virtually inaudible by the audience in a live show. Different headphones and mixers plugged in to your device will have different amounts of crosstalk, so experiment until you find the sweet spot. NOTE: you will always have to deal with bleed to some degree when plugging a pair of earbuds or headphones directly into one side of a splitter that’s connected to your device (it has to do with impedance and tech stuff). 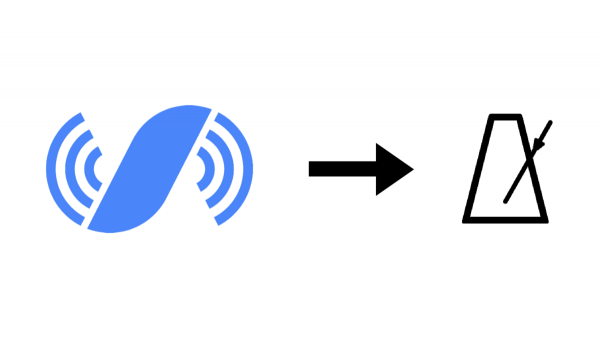 The SCC will do a fine job in most cases, but to get rid of crosstalk completely, consider connecting your device to a mixer or using a 3rd-party iOS audio interface. We’ve found many of these solutions to have no crosstalk whatsoever. IMPORTANT: If you don’t have any crosstalk problems, make sure the SCC is turned all the way down! I only hear the click on one side of my headphones, is there something I can do about that? If your headphones are plugged directly into the cue side of the breakout cable from your device and you’re only hearing sound out of one side, try using a mono adapter (such as THIS 1/8″ or THIS 1/4″). TIP: Having your Cue signal plugged into some kind of mixer before it reaches your ears can help, giving you further control over pan and volume. I have a 3rd party audio/MIDI interface, will it work with ShowOne? ShowOne works great with 3rd party interfaces. It will pass audio to any iOS audio interface that supports Core Audio (this is just about all of them), including USB interfaces meant primarily for Mac or PC. 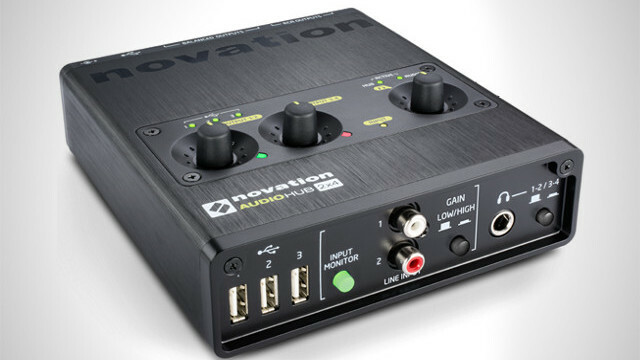 The Apogee Duet/Quartet, Focusrite Scarlett Series, and Novation AudioHub 2X4 are just a few that integrate with ShowOne. Having an interface provides higher quality converters, more versatility with outputs, and tactile control. 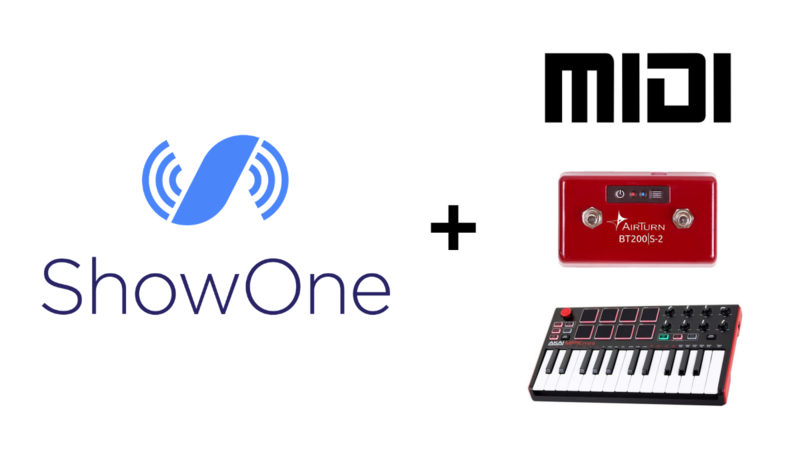 And connect an external MIDI controller such as a keyboard or drum pad to control ShowOne’s transport externally (MIDI control is available as an in-app purchase). TIP: If you have an interface with more than 2 dedicated outputs, you can use ShowOne in 4 channel mode (available as in-app purchase in Store)! See the other FAQs and the Tips & Tricks section for details. I want to use ShowOne for it's sets and audio playback but I don't need the click - what do I do? Either turn the click all the way down in Settings, or put ShowOne into 4-channel (2x stereo) mode, and all track audio will play out the device’s stereo output in full stereo with no click track. TIP: A quick way to make a track play normal stereo even when in 2-channel mode? Set it’s User Cue channel as either left or right. NOTE: If you plan on using ShowOne in this manner, keeping the click in sync is not relevant, so entering the correct tempo when importing is not as crucial. Songs can still be made faster or slower even if the original tempo is imported incorrectly. I want to use ShowOne for it's click (i.e. as a metronome) but don't need to play audio with it - what do I do? If you don’t play to backing tracks but like having a metronome to keep things at a stable tempo during your performances, simply import blank audio files and set their tempos at whatever you want them to be to reflect each song’s tempo in your set. I want to have control of the mix of the instruments within my tracks (using sub-mixes or “stems”) - can I do that in ShowOne? At the moment, no. * In order to keep ShowOne rock solid and stable, and to keep the focus on simplicity and ease of use, ShowOne can only play one stereo audio file at a time and cannot work with multiple tracks or “stems” of the same song within the app. If you want to change the relative levels of instruments in your backing tracks, go back into your DAW session, readjust the levels as you see fit and bounce a new audio file to import into ShowOne. * We are looking into adding some form of this functionality into a later update. For all the details go to our MIDI Tip & Trick. *MIDI features are available as in-app purchases from the ShowOne Shop. My screen keeps going to sleep while I’m using ShowOne, is there a way to fix that? ShowOne is set up to prevent the screen from turning off during playback, but if you’re still having problems go to your device’s Settings▸ General ▸ Auto-Lock and set to “Never“. Do I need to turn off my notifications while using ShowOne? During live performances or other critical situations, we highly recommend turning off all notifications and putting the device into airplane mode to prevent interruptions of the audio. To turn off notifications: Swipe up from the bottom of the screen to open the Control Center, and push the “moon” symbol, or go to device Settings ⇾ Do Not Disturb and turn on “Manual”. Also on the settings page make sure that Allow Calls From is set to “No One”, Repeated Calls is set to off, and Silence is set to “Always”. To enter airplane mode (turn off network access): Swipe up from the bottom of the screen to open the Control Center, and push the “airplane” symbol, or go to device Settings and turn on Airplane Mode. IMPORTANT: Make sure your device is fully charged before playing a show or critical rehearsal, or keep plugged in to an AC adapter. Will there be more features added on to the current version of ShowOne? We have a substantial list of features that we are working to put into ShowOne. We had to start somewhere however, and we wanted to get this out to you with what we felt were the most important functions in the initial versions of ShowOne. But trust us, there is much more coming, so stay with us and keep checking for updates. Don’t hesitate to drop us a line at support@onezerooneaudio.com with any feature you want to see the most in future updates of ShowOne – just put “Feature Request” in the subject! NOTE: The In-App Shop is where new features and add-ons are available for purchase. Go to Shop from the Home page in ShowOne to see the latest. Just two pro musicians who were tired of jumping through hoops to get in sync with live backing tracks. We call ourselves One Zero One Audio. Read our bio HERE. If you couldn’t find an answer in the FAQs, please ask us directly in the Contact field or at support@onezerooneaudio.com. We’ll do our best to get to the bottom of your issue! Cables, cables – what should I get?